Last week our COP 20 delegate Suzy McKinney was published in the Whakatane Beacon with her thoughts on the New Zealand Government's climate policy. Posted on June 1, 2015 by Suzy McKinney and filed under UN Climate Talks 2014, Institute Updates and tagged climate COP20 New Zealand. This weekend, I will be living in a box as a fundraiser for the victims of Cyclone Pam in Vanuatu. This 24 hour challenge got me thinking about the things I desperately need to survive. More importantly, this challenge made me reminisce the time I slept over at the UN. First things first, why would someone even sleep over at a UN conference? Negotiators are not the best people at time management. Throughout the year, preliminary meetings and bilateral/regional talks happen in preparation for the convention. They talk and lobby with a lot of countries but seem not do so efficiently because meetings still run over time. Is it because the climate change topic is truly a big issue to discuss? Or is it because countries just like to exhaust time so that they do not have to compromise? Whatever the answer is, UN conferences such as COP20 always go over time. Thus, it is likely that you will see diplomats and civil society alike scrambling for a seat/couch/corner/beanbag to sleep in on the last few days of negotiations. This brings me to the gist of this piece - what do you need to bring if you're going to sleepover at the UN? 1. Jackets/Jumpers - These pieces of clothing are good for keeping you warm or to use as make shift pillows. They might be quite bulky to carry around during the day, but it's definitely worth the sacrifice. 2. Extension cords - Finding a free plug in a plenary full of people is a mission. Bring an extension cord to save you and your friends the trouble. You don't want to be the only person not tweeting when negotiators turn crazy and use silly metaphors. 3. Snacks - Although the canteen had orders to keep serving food throughout the night, there was a point where they ran out of food (or at least the ones we could afford). Bring some snacks to keep you going and to save yourself from queuing up. 4. Toothbrush and Toothpaste - You are going to be in the same venue as dignitaries and ministers. You definitely do not want to have the morning breath after an uncomfortable sleep in a solid couch. 5. Eye Mask and Ear Plugs - The conference venue in Lima was particularly bright and loud. So if you cannot sleep with lights on or with loud people around, just like me, be sure to bring these two things! Posted on March 26, 2015 by Dewy Sacayan and filed under UN Climate Talks 2014 and tagged COP20 beanbags overnight slumber party. When I was 10 year old, I told my dad that my dream job was to become a political activist. There was just something about shouting on the streets that intrigued me. Obviously, my dad (who worked tirelessly as an architect) said, "No Dewy. You can't be an activist. You're going to be a lawyer." A decade later, my dream of marching finally came true. Thanks to AYLI's Rachel Dobric and Adopt a Negotiator tracker, David Tong's protest tips and advices, I took on the streets of Lima for the People's Climate March. 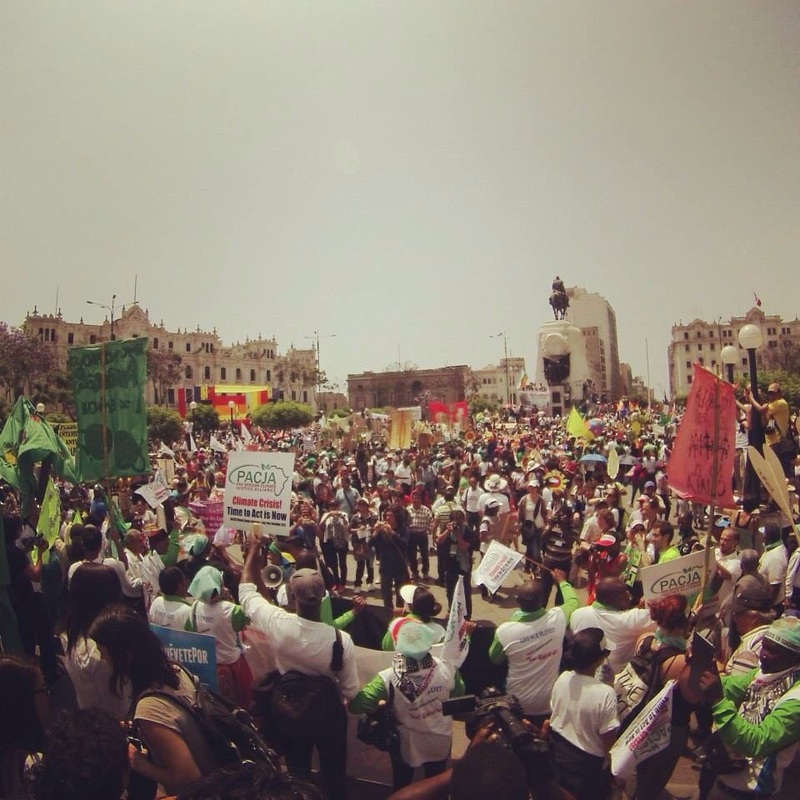 The People's Climate March in Lima was vibrant, loud and purposeful. Indigenous people, women activists, senior citizens, youths and even children joined the protest! With latin music playing and people dancing on the streets, the protest encompassed the culture of South America as well as the beauty our world can potentially have when people come together. AYLI delegate Renee with NZYD delegates Maddie and Tarsh with their slogans. Overall, I am happy I got to shout what I wanted governments to do - 100% renewables. I am happy I got to spend a hot day in Lima with thousands of people who has unlimited love for our finite planet. And finally, I am very happy I am a protest-virgin no more! Posted on March 26, 2015 by Dewy Sacayan and filed under UN Climate Talks 2014 and tagged COP COP20 Indigenous People peoplepower People's Climate March. I was privileged to speak about my experiences at COP20 to one of my sponsors last night. COP was such an immense, intense, cathartic experience that within the 20 minute discussion I could really only give a brief overview of all that happened. But, one thing I was thanked for in particular was including plenty of photos from the adventure. Posted on March 5, 2015 by Benjamin Brooking and filed under UN Climate Talks 2014 and tagged Climate change COP20 climate justice climate Benjamin Brooking. Our COP 20 delegates have made themselves known - check out this interview with Dewy from yesterday's issue of the Finnish newspaper Hufvudstadsbladet (it's in Swedish!). Posted on December 12, 2014 by Aotearoa Youth Leadership Institute and filed under UN Climate Talks 2014, Institute Updates and tagged COP20 climate change UN UNFCCC LimaCOP20 Lima. Yesterday I attended a massive climate March on the streets of Peru's capital Lima, with over 10,000 other people. The diversity and energy was incredible, with strong indigenous representation all the way through, workers in hard hats holding the back of the line to the many different Latin American and international organisations supporting the message that we have to "change the system not the climate." Someone asked me in the days leading up to the March what I thought of that message, what it actually means and how we articulate it. On the surface it is an acknowledgment that in solving this massive issue we have to look past the bandaid and false solutions and face the root causes of climate change. Which is why I like it; climate change is the accumulative result of systemic dysfunction, to address the many impacts of it we must look at that dysfunction as well. But how do we do that in a world where many people, especially one in positions of power, do not clearly see the links between climate change and food, human rights, poverty, indigenous sovereignty, violence against women etc ? I don't have the answer to this, but what we talked about that night before the March was values, the values which inform decisions made internationally, nationally and in our own homes need to shift. From individualistic, short-term, status quo & colonial; to collective, long-term, equitable, power sharing and wellbeing focussed. What is best for us & the earth collectively, what keeps us healthy and well. At the March yesterday I was overwhelmed with the strength of messaging about these simple things we have to protect which look after our well-being and the earth. There was strong stuff about the COP and how it is missing some key elements, but what I mostly saw was calls for water, soil, the earth, communities, people and children to be looked after. I have been a bit lost in the academic and international politics world at COP, sometimes wondering what I am even doing there. But it is this simple. Water, food, community, forests, life - it's our job to stand up for these things and protect them. Posted on December 12, 2014 by Renee Annan and filed under UN Climate Talks 2014 and tagged climate climate change climate justice march COP20 COY10. While in Lima, I had the opportunity to talk to the Amazonian people of South America. From these conversations, I realised how marginalised and overlooked these indigenous people are. Now, I set out to share their personal stories to the world. Have you ever been to the forest? In the Shuar province of Ecuadorian Amazon, you will see beautiful rivers graced with luscious flora and fauna. You will hear many birds chirping and snakes hissing around. You will be amazed by the tall trees and the abundant fruit which grows from them. You will be surprised with the wondrous effects of the herbal medicines which grow from our fertile soil. Some can even cure cancer! What about Port Ayacucho in the Amazon state of Venezuela? Have you been to this mountainous province? We are known for our grand mountains with interesting features and our huge river with many fish. Why don’t you visit our homes and see how we live? Here, you will see through our hearts how we respect Mother Earth and how we depend on her for our own existence. Here, you will see how our homes are rapidly changing because of climate change. Due to stronger heat and less rainfall, our food production is reducing. Our herbal medicines are depleting. Our land is drying to the point that we can’t use it for anything – not even for living. Due to the acidification of water, our fish are dying. We now have nothing to sell or to eat. The forest is our home, market and drugstore so we need to defend it. Why don’t you visit our homes and explain to our children how dark their future will be? Day after day they ask us why there are no fishes and why the ground is so hot. We, the indigenous people, do not get the same education as you about climate change so our children are neither aware nor prepared. Yet, we know this is a serious issue because we can feel its effects on our existence. Why don’t you visit our homes and see the sad reality of how indigenous people live now? Our government, your boss, are telling us to leave our forest and our homes so that companies and miners can come and exploit our Mother Earth. But where are we going to go? Where are we going to get our food? Who is going to take care of our forest? We, the indigenous people, don’t care about money. We don’t care about living in the city. We don’t want to exchange our headdresses and tattoos for fancy clothes. We want our children to continue our traditions and our rituals. We want our children to love our forest like we have. We want our children to be able to plant crops, climb our tall trees and fish from our river. We want our children to be able to sustain themselves. We are scared about our children’s future – so why don’t you visit our homes and listen to us? All posts by Institute delegates reflect heir own thoughts,opinions and experiences, and do not reflect those of the Institute. Posted on December 10, 2014 by Dewy Sacayan and filed under UN Climate Talks 2014 and tagged LimaCOP20 Amazon COP20 Venezuela Indigenous People Ecuador. Kern Mangan-Walker: COY10, my First Week of Lima and COP. I’ve been in Lima for 7 days now. I’ve meet young people from all across the world, made many new friends, connected deeply with the global youth climate movement, seen ridiculous fountain light shows, explored current archeological digs and got stuck into supporting civil society activities around COP20. There is always something happening in the streets — Marauding colonies of cats, traveling Peruvian bands or late night religious vigils. Controversial photo with Christina Figueres, the Peruvian environmental minister and the youth at COY. Some young people were concerned that this photo was taken without their permission. (source: COY10 organizers). Last week and over the weekend I attended COY (conference of youth) which was a space dedicated to educating young folks on climate change, solutions and how to make them a reality. This year we had 700 young people from all over the world, with the vast majority coming from other Latin American States and unable to attend the actual UN COP20 conference. For them it was their only chance to connect with those from the global youth climate movement and their only chance to have a voice their perspectives in the international climate negotiations sphere. It was way less focused on movement capacity building than I had expected and more focused on general education around climate change. This was less useful for me. Still, I absolutely loved the opportunity to connect with YOUNGO (youth constituency in the UN) and to talk with similar counterparts from different parts of the world. It was amazing to hear about all the incredible things that different movements achieve. I´ve been blown away by people´s passion for creating good outcomes and was absolutely amazed by the fact that Tuvalu fasted on Monday to raise awareness around climate change. One thing that I´ve come to understand is that there is no one pespective on behalf of all young people. Everyone represents different contexts, experiences, geographic situations, socio-economic conditions and experiences. What unites us in our interest in building a better future for ourselves and for future generations. This link is powerful. I´ve also had the incredible experience of spending time at a large building called CasaActiva or the Convergence Space. This is a large house where different movements and organizations are organizing around COP20, making things for actions, operating a community radio station, coordinating campaigns and preparing for the People´s Climate March on the 10th of December. Lima, which appeared to be somewhat dry and desolate from the air is a bustling metropolis with 4 million people and an endless array of activities. It was also a huge shock arriving here and conversing with other New Zealanders for the first time in many weeks, but wonderful to connect with the great people of my delegation. The hostel we´re staying in is great, in a part of Lima named Miraflores (AKA. Home of the Gringo) with a rooftop bar and warm, friendly staff. Our small 8 bed dorm kingdom sits alongside those from many different delegations, from Holland, Germany, the US, Norway and a few others. Sharing the hostel with so many highly motivated, intelligent and interesting people is a lot fun, often leading to conversations which go until 5am. Hence its lucky that I´m not at COP this week. Having a week off COP20 means that I´ve had time to get to know locals, explore parts of Lima, be part of organizing with other social movements and support the NZYD and AYLI delegations on the inside. This has been rewarding. Yesterday I had the privilage of exploring a working archeological site where a 1800 year old pre-Incan Pyramid is being excavated. With already 50% uncovered, it is a sight to behold — rising 30 metres above the surrounding cityscape, making it a highly immodest pyramid. People worry that COP is broken. That the political deadlock cannot create a deal that will keep global temperature rise below 2´C. Still the talks go on with every country trying to create the best outcome for themselves and sometimes the wider world. It´s hard right now because I love New Zealand but at the moment we´re one of the biggest backsliding countries and barriers to positive outcomes from the negotiations. I wish I could be proud of what we´re doing but right now I can´t. New Zealand has some of the lowest emissions reductions targets in the developed world (5%). We don´t plan to increase this target unless the world comes together to build an international climate pact which lowers emissions and creates a safe, 2´C temperature rise limit. Unfortunately we´re at the same time advocating for a treaty which according to our own treasury, will not achieve this. From a purely skeptical perspective it seems like we´re trying to bury our own emission reduction failures and ensure we don´t have to aim higher. The craziest thing is we´re actually on track to a 36% increase in emissions from 1990 levels by 2020. I optimistically hope that New Zealand will do the responsible thing and increase it´s targets while contributing to a positive international deal but right now I´m not so sure. Whatever happens, I´m in COP20 next week and I can´t wait to ask our representatives first hand about this inconsistency. I´m cynical about having a positive outcome from these negotiations but can only hope for the best. Not for my own sake, but for the sake of future generations, for the suffering people of the Phillipines and every part of the world already impacted by climate change. Posted on December 5, 2014 by Kern Mangan-Walker and filed under UN Climate Talks 2014 and tagged climate climatechange climate justice COP20 COY10.